WILLIAMSBURG—The departure of Stephen Kulik from the 1st Franklin District has prompted a mad dash of contenders. Given the subtle differences and stark similarities among the 19 towns that constitute the district, the field of candidates reflects a broad range of experiences and backgrounds. One such dimension of diversity is age. Keeping and attracting young people is a major challenge for the district. Casey Pease, a college student and former Bernie Sanders organizer, has argued few can address that issue and others in the region better than somebody his age. The 1st Franklin House district’s cast of characters includes towns of Ashfield, Buckland, Conway, Chester, Chesterfield, Cummington, Deerfield, Goshen, Huntington, Leverett, Middlefield, Montague, Plainville, Shelburne, Shutesbury, Sunderland, Whatley, Williamsburg, and Worthington. Pease is one of seven candidates seeking the Democratic nomination. Many, if not all are top-tier due to volunteer armies, fundraising abilities, or granular familiar with the district. Arguably Pease has at least the last of these. His campaign highlights he attended the 1st Frankin’s schools and lived its residents’ struggles. Pease has been active in local politics, too. That ultimately led to a whirlwind tour of New England and the Midwest for Bernie Sanders’s 2016 presidential bid. “He has a natural ability to unite and understand the nuances and unique needs in each of the four counties in Western Mass,” said Karen Lee, a Sanders Western Mass Field Organizer. Over a beer at a Route 9 restaurant here, Pease, sporting fresh navy-blue campaign swag, discussed his bid and background. He recalled the exhilaration of Sanders’s campaign and reminisced about his earlier life. A command of policy—and a few wisps of stubble—convincingly concealed that only recently did Pease become able to (legally) enjoy the drink he was nursing. Unlike Williamsburg, a mostly affluent suburb of Northampton, Pease’s hometown Worthington sits somewhat suspended between the Pioneer Valley and Pittsfield. Pease credits the town’s elementary school—nearly closed in recent years—and its library with providing a foundation upon which to grow and learn. Other experiences like managing Liston’s Bar & Grill in Worthington exposed him to people with varied perspectives. Politics was in the family. His grandmother was Worthington’s first Selectwoman. At age 9, Pease got a taste of politics during his aunt’s unsuccessful state senate bid. Pease’s parents—a logger and a nurse—exemplify the struggles. His mother works in for Berkshire Health system, which just reached a deal with its union staff. Meanwhile his father has had to grapple with the implosion of his trade as the price of timber collapse. “It’s a lot different than living in a big city,” Pease said. “One of the reasons I decided to run is it is incredibly important that the next representative is somebody who knows what it’s like to live here,” he said. One issue on Pease’s radar school transportation. Though the state has routinely underfunded regional transportation for year, regional school district routes span several communities while collecting relatively few kids. Though a 1949 law supposedly promises reimbursement to regional school districts, appropriations consistently come up short. Regional districts end up raiding funds for programs or operation just to get students to class. But Pease dug deeper, discussing Chapter 70 education funding and the stress school funding puts on the limited tax bases of the district’s small towns. To counter this, the legislature must approve more “sparsity aid” to rural school districts like those in the 1st Franklin. Hardly shocking for a Sanders alum, Pease supports single payer healthcare. Pease says it will take someone bold to shake up Beacon Hill on the 1st Franklin’s behalf. Pease acknowledges there are transition issues, like what to do about health insurance employees. At a minimum, he argues, legislative committees should begin holding hearings to determine how to ease the pain and/or consider how to work with neighboring state to achieve a single-payer system. Then there is agriculture, a central industry and, historically, an attraction for newcomers. While discussing education, Pease also noted the limited opportunities to promote agriculture on the high school level. He blamed state testing requirements crowding out other programs. However, he did acknowledge Greenfield Community College had such programs. Pease said farming in the 413 needs more state support whether that is connecting food stamp beneficiaries with farm fresh food or farmland preservation. He noted that Worthington was down to one dairy farm. Given plummeting milk prices, Pease said farmers could try to turn their product into organic yogurt or ice cream. To do that, the state or federal assistance will be crucial, Pease said. Pease had been talking policy since appearing before Worthington’s Town Meeting at age 16. That day being many years off per the Constitution, Pease turned to organizing for Sanders as a UMass freshman. Sanders’s campaign noticed and hired him as a traveling organizer the following spring. 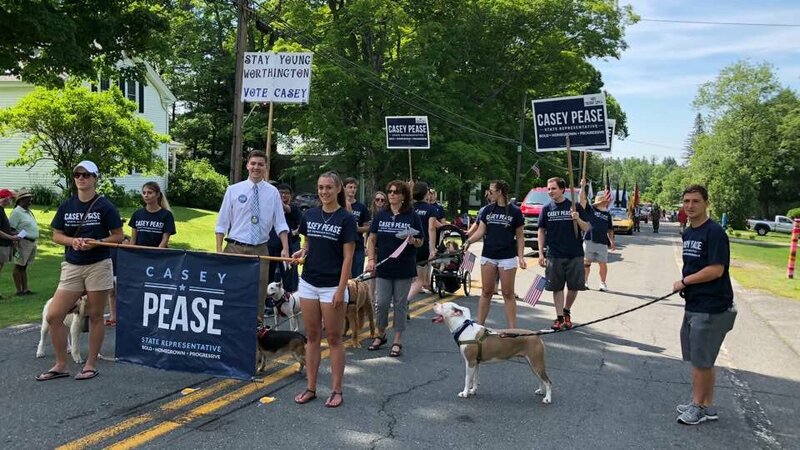 “Casey stood out prior to joining the campaign for organizing his fellow students at UMass for various rallies for Bernie Sanders and bringing many of them up to New Hampshire to knock on doors for Bernie,” Erika Uyterhoeven, the Sanders campaign’s National Director for out-of-state organizing, emailed. Because he was “driven, hard-working, and persevering,” Pease stayed on. “Given his passion and love for the community where he’s from, his work ethic and determination, I can’t think of someone better to represent his district,” Uyterhoeven added. According to Lee, when the campaign came to Massachusetts, Pease took a lead organizing areas that include the 1st Franklin district. By early spring, however, Sanders’s campaign began downshifting. Pease was laid off. He led Andrea Harrington’s state senate campaign, though she did not advance past the primary. Pease returned to college, but it was jarring returning to his old life. Yet unlike some, 2016 had not disenchanted him. That, in many ways, loops back to his campaign for state rep. Reversing the decline in the 1st Franklin require better education funding, jobs, and infrastructure and “a vision for the future,” Pease said. At least part the solution is giving the future, i.e. the next generation, a chance to have an impact. Pease noted many more young people are getting involved and running for office than ever. He pointed to the students from Parkland, Florida. They have set off a wave of youth participation after a gunman murdered 17 in their school. “Quite frankly, now is our time,” Pease said, perhaps echoing Deval Patrick argument a dozen years ago. Pease said he has assembled a diverse, young campaign. He hopes, win or lose, his staff will be ready to take on future races, too. Still, he has a unique position in this race. Pease called it “humbling” that because of his years of activism and relationship-building, his candidacy is not a longshot.